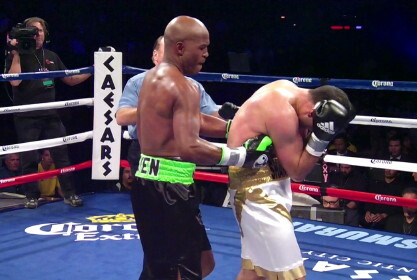 By Rachel Aylett: At the weekend Bernard Hopkins was involved in one of his most incident-packed fights for years, as he turned back the futile challenge of the Sauerland team’s Karo Murat. Murat was so determined not to be intimidated and roughed up by Hopkins that he was ready for a rough-house war, which is pretty much what it turned into. Murat was lucky not to be disqualified as he perpetrated almost every foul in the book during the fight, most blatantly punching on the break on numerous occasions. Referee Steve Smoger only took one point away from Murat during the fight, for that very offence, but had he been more stringent a disqualification may have resulted. Whilst Murat was getting involved with the naughties, Hopkins was busy boxing his head off. He simply couldn’t miss with his right hand leads, which thudded home throughout the fight. Murat was tough but we’ve yet to see anyone who can match Bernard for the inside game, as he always manages to have one hand free in the clinches to beat his opponent round the ear with. He is a genius at this and his short punches inside are deadly accurate. When the dust had cleared, B-Hop was a comfortable winner, as everyone suspected he would be. Murat deserves his place as a fringe contender, but merely because there is such a lack of depth of quality in the light-heavyweight division. What next for Hopkins? He suggested in the post-fight interview that he would either be going up or down in weight. He has been calling for a match with Floyd Mayweather Jr. during the past few weeks, but this seems unlikely. Perhaps Carl Froch could be on his radar, assuming Froch beats domestic rival George Groves on 23 November in Manchester. As far as going up in weight is concerned, I’m not sure who he could make money against in the cruiserweight division as this is very Euro-centric at the moment. The obvious matches for Hopkins would be in his own division, against rival champions Adonis Stevenson and/or Sergey Kovalev. I think it unlikely that B-Hop will fight either. They are both too young, strong and dynamic for Hopkins at this stage of his career. He risks taking a beating off either one and I doubt he will entertain the thought of that. On the subject of Hopkins, I am surprised that boxrec.com has him rated as no.1 light-heavyweight, considering the ease with which Chad Dawson beat him. It just proves that you can’t rely on computers and/or statistics when compiling ratings. I actually believe there is a vulnerability about Hopkins now which could be badly exposed at any point, this being the reason he won’t take on Stevenson or Kovalev. Whisper it very softly, but I even think Nathan Cleverly would have a decent chance of beating him, with his fast, busy style perhaps outworking the older man. Okay, so Cleverly was blasted out by Kovalev, but Hopkins has never been that big a puncher, especially at light-heavyweight, and Cleverly’s speed and range would give him massive problems. As I write though, I am hearing that Cleverly is moving up to the cruiserweight division. I’m not sure about his reasons for doing so but he must be warned – they hit hard in that division too! A final word on the fight leads me to the referee Steve Smoger, who put in a strange performance. Steve is one of the most popular referees in the business and is renowned for being quite lenient with fighters. This Saturday he let Murat go too far. He deducted one point from Murat’s score in the seventh round for yet another punch on the break, and he was clearly getting fed up with Murat’s constant flouting of the rules. At the end of the fight, as Murat tried to put the head in on his opponent, Smoger put the flat of his hand in Murat’s face and pushed him away. This is highly unprofessional. Smoger was also heard swearing during the fight whilst becoming exasperated with Murat. Smoger’s worst offence though was to be seen hugging Hopkins at the end of the fight. This is a definite no-no. Steve obviously wants to be everyone’s friend, but there comes a time when you have to step back and just be a referee. Come on Steve, everyone loves you, don’t spoilt it! On the other side of the Atlantic, Kell Brook did the expected by defeating Vyacheslav Senchenko. Not many people expected him to do it so convincingly though. He completely dominated the Ukrainian before stopping him in the fourth round. This really does little for Kell’s standing in the game. It confirmed his rating as being somewhere in the bottom half of the top ten, but he has held this position for the last few years. There is no reason why Kell shouldn’t fight the winner of Alexander and Porter, other than perhaps the continued reticence of his own promotional team. Once again after this latest fight, it seemed as though his promoter Eddie Hearn was trying to negotiate a different fight for Kell than the mandatory challenge he has earned. The plan seems to be to try and get Amir Khan in a massive pay-per-view fight in the U.K. This made it clear yet again that the camp does not fancy his chances of going to the U.S. and taking the belt from Alexander. It is quite hard to read what Kell thinks about the whole situation. This lack of confidence from the backroom staff cannot be helping him. I’m not sure he has that much confidence in himself anyway. I always remember his appearance on Sky television’s Ringside programme alongside Amir Khan last year. Throughout the banter that went on between the two, it was Khan who was goading Brook. He said whatever he pleased with little comeback from Brook, who acted as though he was being confronted by the playground bully who had several times previously taken his dinner-money. As for Brook’s future then, it is still uncertain. Perhaps not “all of the lights”, just “some of the lights” for the Yorkshireman. Just a word on the next Copper Box bill in London on 30 November 2013 being promoted by Frank Warren. I mentioned a couple of weeks ago that the promoters would struggle to find a worse opponent for Dereck Chisora, following the pull-out of Arnold Gjergjaj. They have certainly done their best/worst, as the substitute opponent was announced this week as being Italian Matteo Madugno. As soon as this came out, Ukrainian tweeters quickly pointed out that Modugno was blitzed in two rounds by soon to be pro Olexander Usyk in the World Series of Boxing competition earlier this year. There is actually no shame in this as Usyk, despite being yet to turn pro, will probably be able take Chisora inside his first five pro fights. He is so fast and mobile and although really only a cruiserweight, has the punch of a heavyweight. I have seen Modugno though and the Italian giant is extremely slow and lumbering and really doesn’t belong in the same ring as a top-10 heavyweight like Chisora. In my notes of his winning contest against Adnan Buharalija in March 2012, I wrote “so bad even Tom Dallas would beat him”. I also noted that he was “terrible”. I just hope that Chisora doesn’t drop to this opponent’s level on the night, as he is sometimes wont to do. To be fair to Frank Warren, the rest of that upcoming Copper Box show looks very promising with some really well-matched contests. That show will be televised in the U.K. on specialist boxing channel, BoxNation.